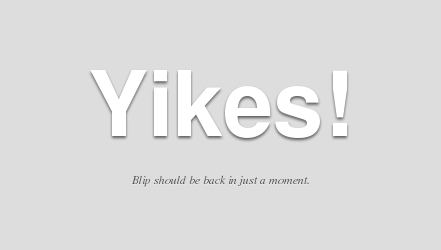 @Blip is [no longer] down. Blip.TV, the video provider relied upon by many independent digital shows has been down since a little after 2am PST, according to isitdownrightnow.com. Because of this, any videos hosted on Blip.TV (for example, Category5 Technology TV on-demand and main RSS feeds) are entirely inaccessible, and even the Blip.tv web site is not available during the outage. I must say, this is a first that I’ve ever seen such an extended outage for Blip.TV, who have always been pretty reliable in spite of their growth. Their Twitter feed is silent, and since their site is down, we know nothing yet about what’s going on, but we know it’s down, and has been down for several hours. Update #1 – Auto tweets and blog entries continue to auto-post (albeit, laced with deadlinks), but no sign of any realtime notes from Blip.TV directly. Update #2 – Tasherre Risay commented below that Blip.TV is located in New York. Absolutely understandable then that there’d be issues. I hope everyone is okay, and our thoughts and prayers go out. Hoping for at least an update as to the status and what’s actually happening. I received a note from Blip “We are currently experiencing unexpected downtime due to flood water in Manhattan affecting our colocation data center. We expect to be back up within the hour as the generators come online but may experience temporary outages through Friday.” Our thoughts continue to be with the Blip team and all those who are affected by Hurricane Sandy. Update # 4 – Annie Tsai (Blip.tv’s social media manager) informed us below that she’ll be able to update us via social media now that she has access to power. Update # 5 – 12:45pm Eastern – Blip.tv is responding and serving up videos!